[Returning for 2018] So the Chipwich has returned. 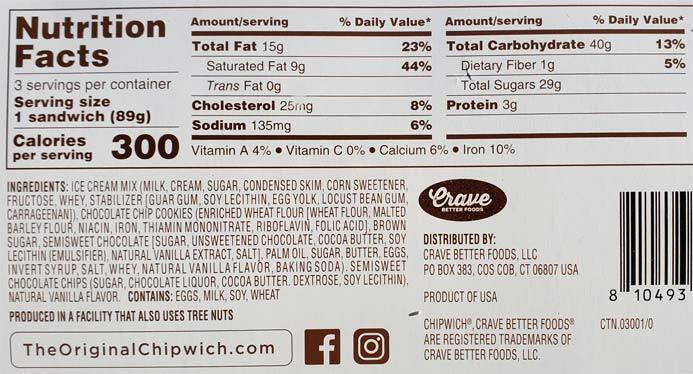 I feel like we all know chipwich (or a clone of it). Vanilla ice cream between two chocolate chip cookies that's been rolled in chocolate chips. Maybe you used to get them during school lunch? I think I did, unless it was the tollhouse version, it was kind of a long time ago. The good news is that they are back after an 8+ year hiatus (you can read more over on wikipedia). Are you ready to see if they look as good as you remember? Look, I love cookie ice cream sandwiches so it doesn't take much to win me over. The only real note I have is that the chocolate chips distracted me more than expect while devouring the first box. I wanted a little less crunch and a little more cookie flavoring, but they were still good. The cookie wasn't dry or stiff, the sandwich held together well, and it is an overall enjoyable treat. Crud, almost forgot to mention that Chipwich sent me four free boxes of these to help spread the word about their return. You've probably seen a few instagrammers posting these over the last few months. Each box (3) 4.25oz sandwiches. I've seen them at Shaws for $4.99 a box. Basically they are a little more expensive than other choices out there where you might get 4 or 6 in a box, but they are definitely still worth a try. On Second Scoop: I opened box #2 to get some better pictures and it was funny how I got less chips and more cookie flavor this time around. Granted, it's probably partially in my head (it's only 7am), but it's something to think about. I think a lot of times, it's about the speed of which I'm eating combined with what I'm looking for in my bite. Or maybe less chips helped me to focus. 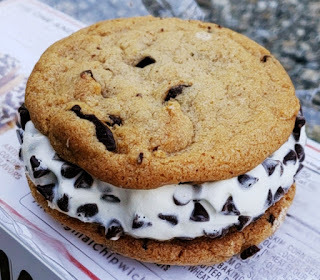 Either way, still nothing wrong with having another cookie ice cream sandwich on the market (we've now got M&M's, Friendlys, Good Humor and Coolhaus in my area). Do you think they beat out toll house--which is supposed to be the same thing, more so than the other similar competitors. It's hard to say. According to wikipedia, they had years of financial trouble and eventually wound up in Nestle's hands who wound up killing the product off so it wouldn't compete with the townhouse version.